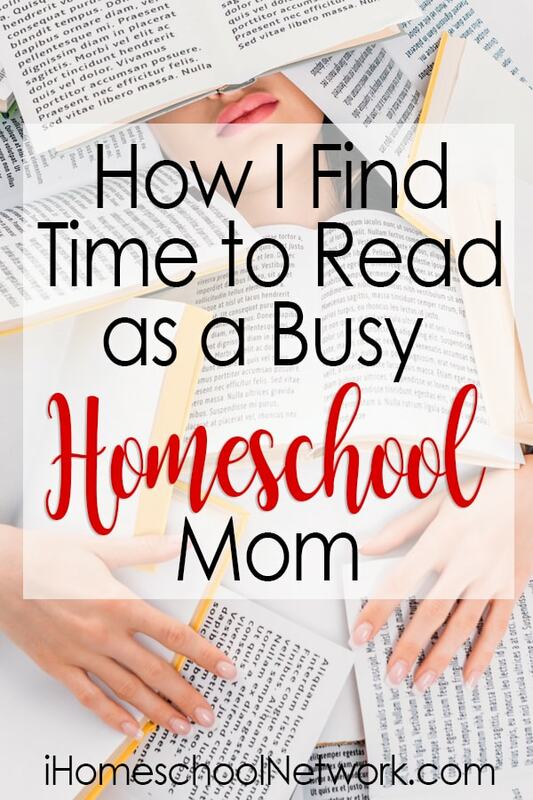 Maybe you have not found the time to read as a busy homeschool mom. 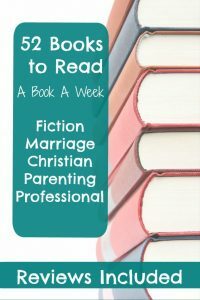 As a homeschooling mom of 5, I thought my reading days were behind me. When I was nursing little ones, I read a lot. I would read while nursing often in the middle of the night. I finished book after book. Then, my kids grew into toddlers, preschoolers, elementary-aged children, and now we are knocking on the door of the teenage years, finding time to read became hard. After I had my fifth child and suffered long and hard with postpartum depression, I realized that I had stopped doing the things I loved. Last year I put my foot down and carved out time for me to read. In fact, I set a lofty goal of a book a week. And I surpassed that goal. I learned a lot from reading a book a week, and I am excited to share some practical tips with you. In order to really get your reading rolling, I highly suggest you set a goal. It can be one book a month or one book a week or whatever makes sense to you. This year I am aiming for two books a week. It may be too hard to reach, but I like having something to shoot for! Also, decide some guidelines for your goal. Are you hoping to read half non-fiction books? What types of books do you want to include? What kinds of books do you want to exclude? Last year I read a combination of fiction and non-fiction. This year I am mainly focusing on non-fiction books with one exception. I am not reading any self-help or improvement books. I am reading to learn more, be encouraged, and find joy. Not to add anything to my to-do list!! Set a few guidelines for your reading goal. 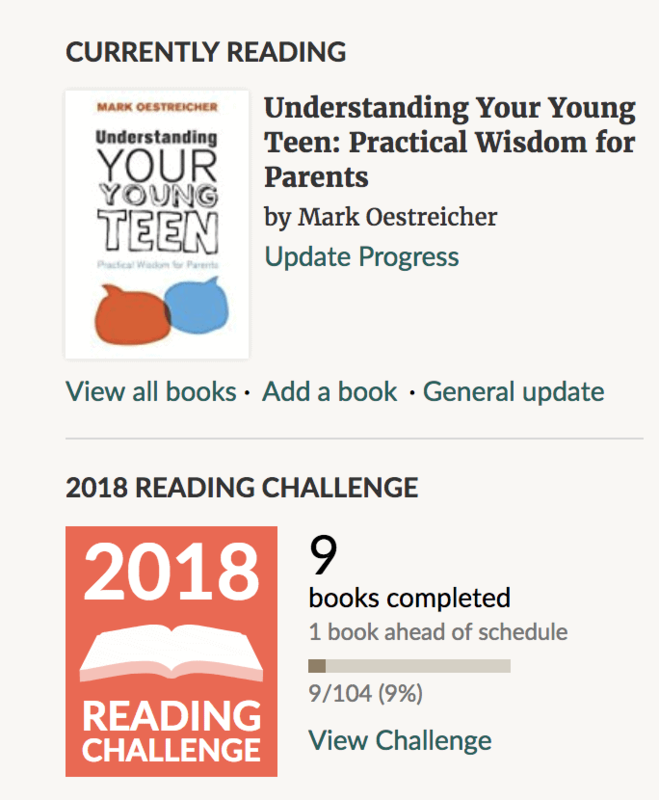 I love using GoodReads to track my reading and find new books to read. 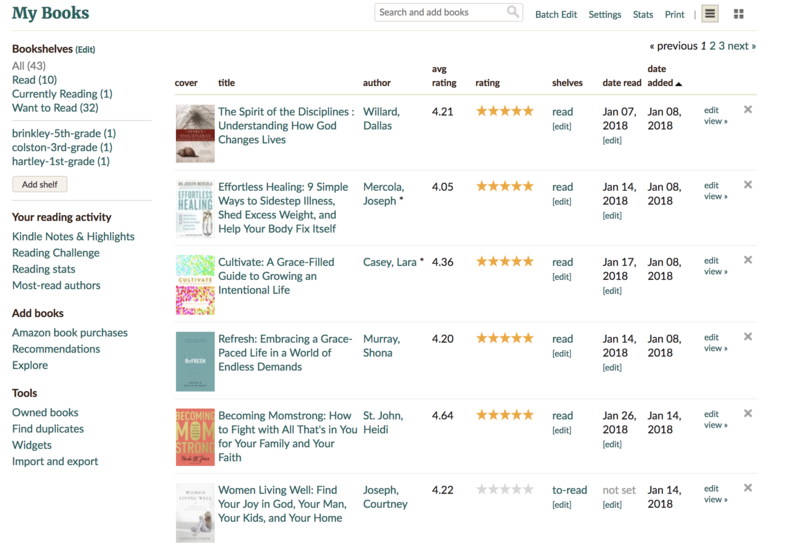 Goodreads is kind of like Facebook for books. You can find people to follow and see what books they are reading. When you find a book you want to read, click on Want to Read and it adds the book to your list. You also can track the books you read and write a review as well. Homeschooling moms have to always remember that their time is so precious. You cannot do it all. This has been a hard one for me to learn. In order to meet my goal and enjoy reading, I do research before choosing a book. I read reviews (GoodReads has them as well), and make sure that this book is a good fit for the time and phase of my life. If I start a book and find it is just not clicking, I never make myself finish it. I might try to push through for a little bit but in the end, if I am struggling, I give myself the freedom to move on. Do yourself a favor and take the time to read reviews on books before you spend time reading. I always make sure the book is from a Christian worldview because that is very important to me. I also think about things that are going on in my life at the time to ensure it is a good fit. Now that I have three independent readers in my home, we have finally set up a family reading time. I use my phone to set an alarm for Monday, Tuesday, Wednesday, Thursday, and Sunday. This alarm goes off at 7 pm and it says FAMILY READING TIME. The big kids grab their current chapter book. I also set them up with headphones and Audible to read along with the book. Allowing them to read in their book and listen to Audible has increased their reading speed and reading grade level. It really works! Dustin and I take time to read to the two little kids. Sometimes we can sneak in some reading time ourselves!! 5. Audiobooks are Books Too! Do not forget that audiobooks are books as well. I love listening to audiobooks when I am walking, exercising, cooking, or cleaning. You will be amazed at how fast you can get through books when you use that “down time” to listen and get your chores done. I prefer listening to non-fiction books when I listen to audiobooks. I know how difficult it can be as a homeschool mom to find time for yourself. It is important to prioritize your day and your time so that you can recharge and recover. I know from years of burnout that you cannot give to your kids what you do not have. For me, reading reenergizes and recharges my batteries. Each evening when the kids are down, I take time to enjoy a cup of tea, a warm bath, and my latest book. I know that when my day is chaotic and overwhelming that I will have some downtime at the end of the day. Find something similar to give you something to look forward to during those harder homeschool days. 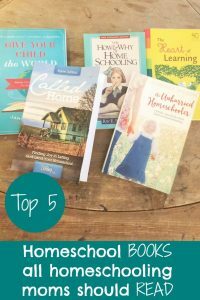 I created this list of Homeschool Books All Homeschool Moms Should Read. If you need some inspiration, see the books I read in 2017 HERE. And make sure you follow me on GoodReads to see my current books and the books I want to read. Christia Colquitt is a homeschooling mom to five children. She is the proud mommy of 4 boys and 1 girl! Her house is loud, fun, filled with laughter, and of course, super sticky floors! Yet, this was not always the plan! After receiving her degree in Biochemistry from the University of Tennessee, she planned on going to dental school. God had other plans, and Christia has never looked back. Christia is married to 11-year NFL veteran player Dustin Colquitt. They make it their life mission to inspire and help others from all walks of life. Christia wants to share her triumphs and struggles in homeschooling, parenting, marriage, and home management on her blog Faith Filled Parenting.